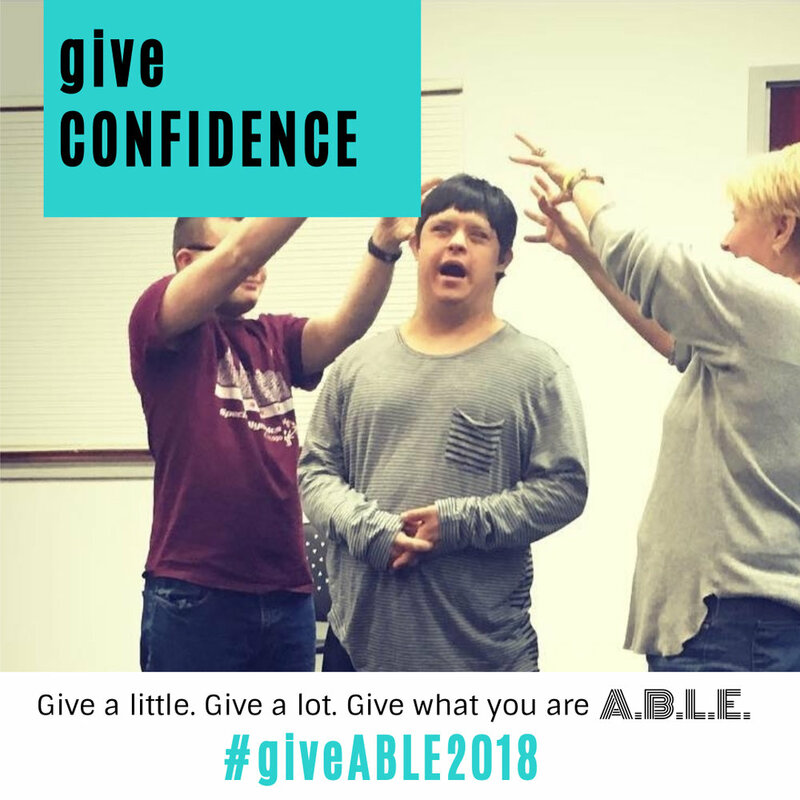 get ready for #giveABLE2018 — A.B.L.E. A.B.L.E. will kick off the holiday season on #GivingTuesday with a 5-week Crowdrise campaign. Occurring this year on November 27, #GivingTuesday is held annually on the Tuesday after Thanksgiving, and the widely recognized shopping events Black Friday and Cyber Monday, to inspire people to collaborate in improving their local communities and to give back in impactful ways to the charities and causes they support. Our campaign, #giveABLE2018, will launch at at the stroke of midnight on #GivingTuesday, and end on December 31st at 11:59pm with a goal of raising $7,000 towards studio rental fees for the current artistic season. The 2018-2019 season promises to be the biggest yet for A.B.L.E. The 18 actors in A.B.L.E.’s teen ensembles are hard at work creating stories for two original devised shows, and, this spring, will join forces for an adaptation of Shakespeare’s As You Like It to be staged at Chicago Shakespeare Theater. Our newly formed Adult Ensemble for individuals ages 22+ will share their talents in two one-of-a-kind Variety Shows at the close of each semester. The core ensembles will spend a combined 200+ hours in rehearsal this season. In addition, A.B.L.E. is expanding outreach programming. We're welcoming industry professionals, like the internationally renowned physical theatre company Frantic Assembly, to lead guest artist masterclasses that deepen our ensemble's experiences with different types of performance. After the success of last summer's workshop series, we're looking forward to leading more specialized one-time workshops. A.B.L.E. teaching artists are leading a 6-week residency with students from The PACE program at National Louis University, and are pursuing additional partnerships with other community organizations that serve individuals with developmental differences. We’re broadening training opportunities to support our teaching artists and volunteer facilitators. Occupancy expenses account for over 30% of A.B.L.E.’s program budget. We do not have our own location, so the cost of renting space for all of these sessions adds up quickly. Our minimum fundraising goal of $7000 is enough to ensure our teen and adult ensembles have space for their weekly rehearsals. If we can surpass this goal, the additional funds will allow us to go even further with outreach programming and to create more valuable experiences for our actors and others with Down syndrome and developmental differences. Make a Contribution: Every dollar makes a difference. A donation of just $35 will cover one hour of studio time. That’s an hour for our actors to develop lifelong skills like cooperation, communication, and creativity….and to have a good old fashioned A.B.L.E. dance party. Donations helps us keep registration fees down for our participants, and ensures that everyone can have access to these creative experiences. Starting on November 27th, visit bit.ly/giveable2018 to make a donation. Share and share alike: successful crowdfunding campaigns rely on our personal networks. Email this blog post to your network and ask your friends to do the same! 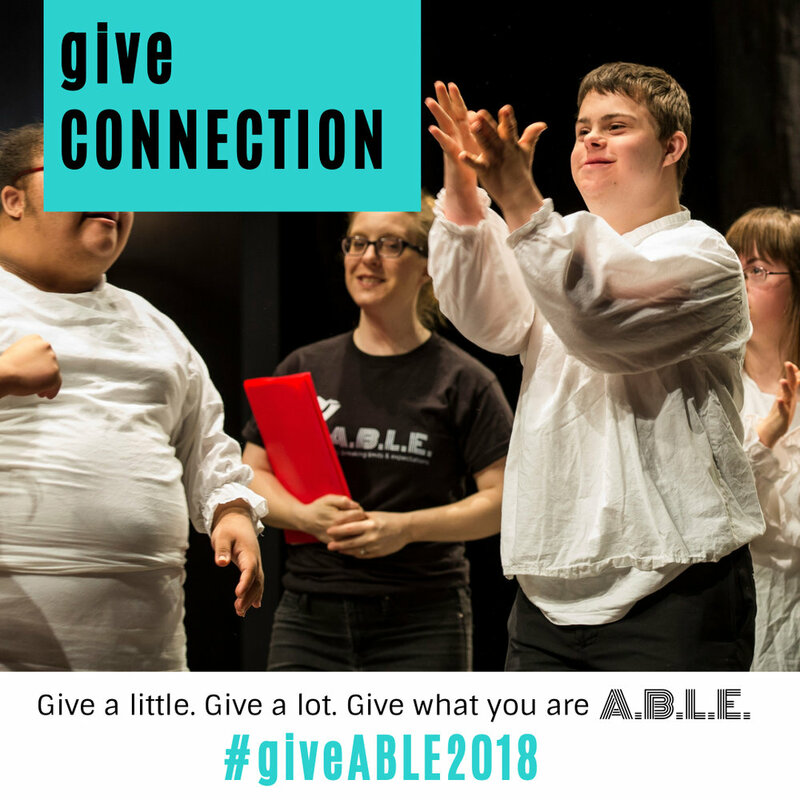 Be socially (media) active: post on Facebook, tweet about #giveABLE2018, #regram us on Instagram and share more about your passion for the theatre and supporting individuals with developmental differences. Follow A.B.L.E. on Facebook and Instagram and like, comment, and share our content to help spread the word! Even if you can’t donate, you can get in the spirit of giving by spreading the word and raising awareness about A.B.L.E. and the work we do. Together, we can build platforms that give individuals with Down syndrome and other developmental differences the opportunity share who they are and all they are A.B.L.E. to do! Older PostRehearsal Log: Week 4 Updates!